I've imported it into zmodeler but there's an issue with the textures and I can't further export the model to 3dsimed. If anyone thinks that can make this thing work I will gladly give the files I have to him. Oooooooohh maaaaan, PLEASE PLEASE PLEASE !!! My heart stopped when I read the thread's title ! Can't wait for this ! BTW, splintert92, any chances to convert for GTL the 1964 Ferrari 250 GTO and/or the Ferrari 250 Testarossa from Forza 3 ??? Nobody did those cars, your Porsche 550 Spyder looks very good... I mean the cars from Forza 3 look at least as good as those from GTL... Just thinking everybody will be very happy to see those cars in GTL, plus Forza 3 is a very good base to add some quality stuff to GTL ! I was sworn to secrecy but now the word is out I'd better hurry up and finish the skins ! Its a lovely looking car. MG - neither Splinter or me can do .bik videos, can you help? Of course, consider the job done ! 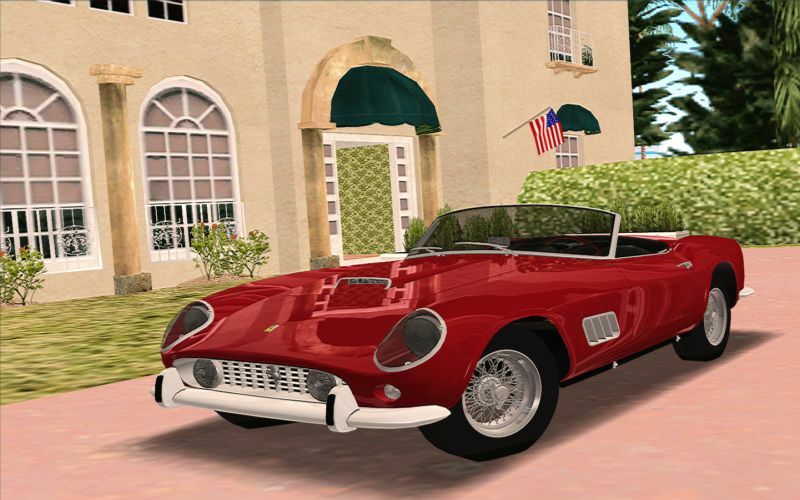 any chances to convert for GTL the 1964 Ferrari 250 GTO and/or the Ferrari 250 Testarossa from Forza 3 ??? Did Butch not do the the GTO? Also, since the cat is outta the bag, the Testarossa and 330P4 are near completion too. Yeah, I know Butch did the GTO, but he did the '62-'63 GTO (Scaglietti), not '64 (Pininfarina) ! Anyway, you just released some AWESOME news today ! Thanks a lot ! It will be great to have another Ferrari in the game. Any chance of doing the Ferrari 250LM for GTL??? It would be really nice to have that to compete against the Cobras and the Corvette Grand Sport from the same period. Splinter - I've just emailed you a 6 car skin pack. I can pass on to MG to do the biks if you are in agreement? I have his email address. Sure Dave, pass em on! splintert92, I love you. What a magnificent conversion!!! This is good news... thank you! Waiting now for these great Ferraris! Unfortunately my not-so-new PC can't handle this nice car. It's a shame. I'm sorry to hear that, it does have 4 lod's if you would like to try lowering your details. Sorry chap, just google dds plug-in for gimp. I have found mine, i'll post it here if anyone wants it. Read the read-me, it tells you where to put it..
Oh, if you have Geditor & can use it, then open the ferrari_tex file & extract the main body texture to the car folder, then re-size that to 1024x1024 DXT1 & leave it loose in the the main ferrari folder..